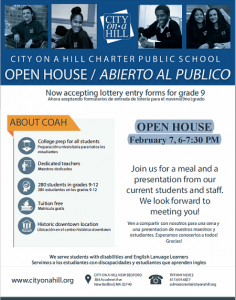 Home / Latest / City on a Hill to hold Open House on Feb. 7th You can apply now for their grade 9 lottery! 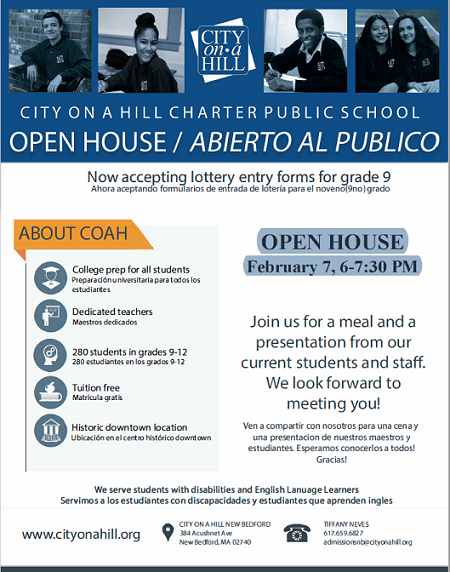 City on a Hill to hold Open House on Feb. 7th You can apply now for their grade 9 lottery! Now accepting lottery entry forms for grade 9. We serve students with disabilities and English Language Learners. Join us for a meal and a presentation from our current students and staff. We look forward to meeting you! Why City on a Hill? College prep for all students Students are offered AP classes, college seminars, and dual enrollment opportunities at colleges across the city. Since our first graduation in 1998, 99% of all graduates have been accepted to college! Students in grades 9-12 receive need-based small group support as a part of their regular schedule. Additional MCAS and ACT prep tutoring is delivered in small group sessions. City on a Hill students participate in Town Meeting debates, service projects, and internships and are registered to vote. Small, safe, and supportive. Respect and responsibility are standard expectations at CoaH. Teachers care about the success of their students and make time to help. 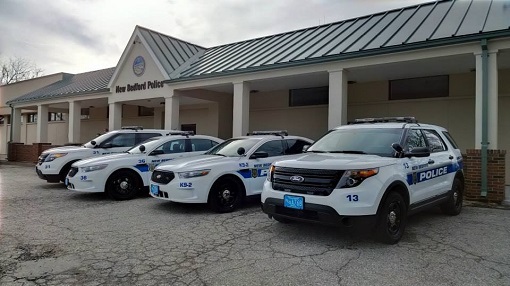 online, or a paper copy can be filled out and mailed to City on a Hill New Bedford’s main office. The lottery for the 2019-2020 school year will take place on March 6, 2019. To fill out the online application, please visit our website. Interested in scheduling a private tour or setting up a day to shadow a CoaH student or have questions? Contact CoaH today! 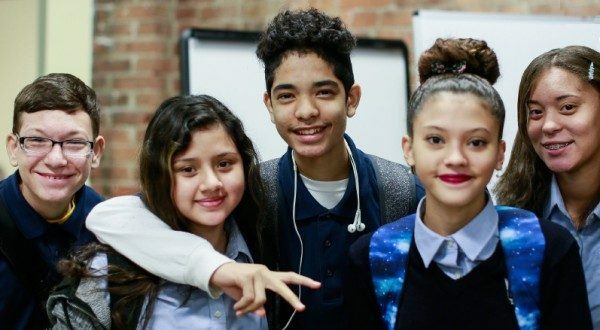 As charter public schools, the City on a Hill Network Schools are tuition-free and open to all students. CoaH has strong Special Education and English Language Learner programs and practices inclusion whenever possible. Admission is by random lottery with new students admitted in the 9th grade only. 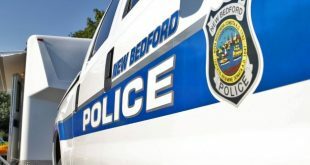 Preference in the lottery is given to siblings of current students and residents of New Bedford. How do students perform on the MCAS? 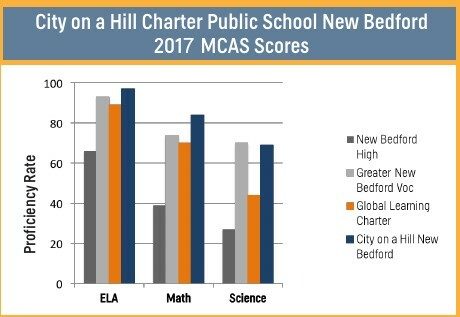 In their first administration of the test, City on a Hill New Bedford outperformed the district. What extracurricular and sports activities does CoaH offer? City on a Hill New Bedford currently offers, cheerleading, girls & boys basketball, volleyball and flag football! Student Government, National Honor Society, music clubs, photography, newspaper club, and several fitness clubs such as Zumba and YMCA. Workouts. Extracurricular activities at CoaH are subject to change based on student input & interest! Prospective students and their families can schedule a tour by calling 617-659-6827. Don’t forget to ask about Shadow Days, where prospective students are welcome to attend classes and be a CoaH student for the day! Shadow Day gives you firsthand knowledge of what it means to be a CoaH student. 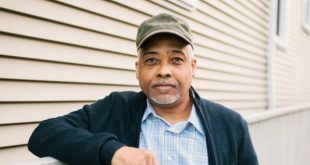 How does CoaH prepare students for college both in and out of the classroom? All students take college prep courses with the option of taking Dual Enrollment classes at Bristol Community College to earn college credit in their junior and senior year. As seniors, all students take the City Project capstone course in which students learn how and why to exercise their rights. In conjunction with the capstone course, all seniors complete 100-hour internships in a non-profit or government office, gaining hands-on work experience, building their resume, and growing their professional network. All students take College Seminars that guide them through the college search and application process, and college counselors meet with families to apply for financial aid. Smart is not something you are; smart is something you become.